With Victor Rask out for an extended period of time due to an injury that was sustained in his own kitchen, the Carolina Hurricanes are searching for a second-line center. 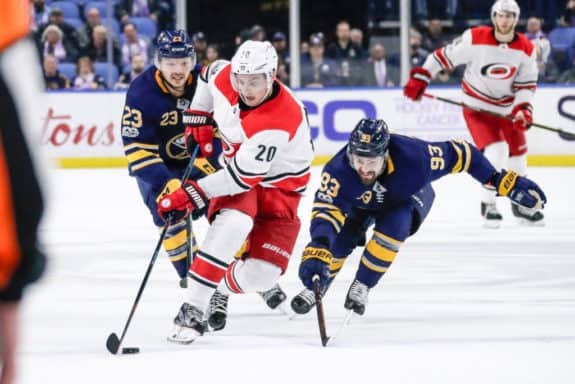 One idea that Carolina Hurricanes head coach Rod Brind’Amour has tried is moving Sebastian Aho from left wing to center. On paper the idea looked like a smart one. Aho has previous experience playing center, although he has functioned primarily as a left winger with the Hurricanes. He also possesses the ability to dictate the pace of a game with the puck on his stick and is not afraid to do the dirty defensive work that is expected out of centers in the NHL. At 21 years old, it stood to reason that moving Aho into the center slot could be the accelerant that turned him into a legitimate star in the NHL. Alas, ideas that look good on paper do not always turn out successful in practice. That has been especially true with the Aho-at-center experiment, and there are two major reasons that stand out in explaining why the experiment should end immediately. The proverbial eye test has shown that Aho looks out of place at center. “I haven’t really liked what he’s doing in the two games,” Brind’Amour told Chip Alexander. 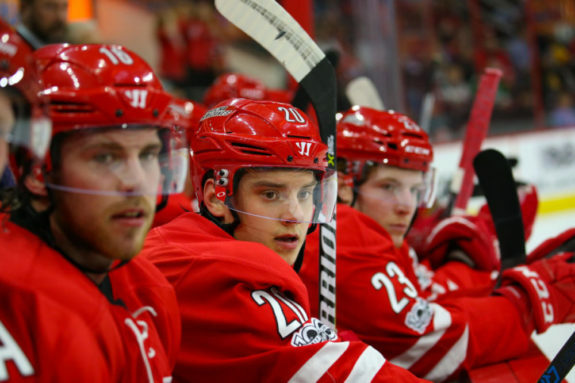 “I think we’ll run it through the preseason and then we’ll kind of make an assessment.” (from ‘Hurricanes top Caps 5-1 for third preseason victory’, Raleigh News & Observer – 9/21/18). Aho has yet to put up a point in the two games he has played at center. While that is not the end of the world, it is indicative of the fact that Aho’s defensive responsibilities at center take away from his ability to create on the puck. Aho’s game has been successful over the last two years, and in 2017-18 in particular, because he was emboldened to be creative with the puck and take risks off of it. That has not been an option during the current preseason, as Aho has been paired with rookies Andrei Svechnikov and Valentin Zykov. These linemates are not cemented in stone, but the Hurricanes young roster means that Aho is going to have to continue sacrificing his offensive abilities in favor of defensive duties. This inherently limits his ability to create scoring opportunities, which is arguably the chief reason Aho is on the ice at any given time. Carolina lost 125 points this summer with the departures of Noah Hanifin, Elias Lindholm, and Jeff Skinner. They need Aho to approach the 100-point mark that he set as a goal for the 2018-19 season rather than moving backward from the 65 points that he put up in 2017-18. The early results tell us that the latter situation will occur if the Hurricanes move forward with Aho at center. The bigger issue than what we have seen so far this year is what Aho has done in the past as a center. In taking a look at Aho’s faceoff percentages against Aleksander Barkov, Claude Giroux, and John Tavares, the picture is not pretty. Aho has a 40-percent faceoff win percentage against these three players, who represent who you would ideally like to see Aho lining up against as a first-line center in the not-too-distant future. While you may argue that picking those three centers is a tactic in isolating a bad set of statistics, the broader picture tells the same story of incompetence in the faceoff circle for Aho. According to Puck Base, He had a 45.1-percent faceoff win percentage during the 2017-18 season, including a 46.8-percent win-rate in the offensive zone and 39.7-percent win-rate in the neutral zone. The reason that these two rates are so important is because 120 of the 144 faceoffs that Aho took during the 2017-18 season came in the offensive and neutral zones. There is a simple reason for this; namely that the Hurricanes want to put Aho on the ice in situations when he can create offensive opportunities rather than forcing him to play defense. If he is not winning face-offs in these zones, then the Hurricanes are squandering possession and driving down their ability to score goals. When you isolate only shots that made it on net, Aho was worse than the league-average NHL faceoff taker in the offensive, neutral, and defensive zones in the 2017-18 season. His NSPF was minus-1.45 and NSPF/FO was minus-.0604 in the defensive zone, minus-0.59 and minus-0.0095 in the offensive zone, and minus-2.00 and minus-0.0345 in the neutral zone. The Hurricanes were not only squandering possession as a result of having Aho in the faceoff circle, but they were also letting up more shots and scoring chances as a result. Whichever way you put it, these statistics show that Aho was a net-negative as a center during the 2017-18 season. There is no reason to think that this would change in 2018-19. There is a tendency to want to trash statistics like the ones that I have cited, look around exasperated, say that Aho will improve on whatever flaws he has, and push forward with the move from left wing to center. You may also point out that I have not cited who should actually play second-line center behind Jordan Staal. The most obvious option within the Hurricanes organization is Martin Necas, who is a natural center and has experience playing the position full-time as a professional with HC Kometa Brno in the Czech Extraliga in 2017-18. Necas has been manning the third-line center position during the preseason, but his speed and creativity with the puck make him a more natural second-line center than third-line center. Another option would be to look outside of the organization and sign a placeholder for the position. One option that is available is Michael Cammalleri. While he is not a flashy option, Cammalleri is a veteran figure who could help the Hurricanes youngsters develop and he can be counted on to put up 30-40 points over the course of the 2018-19 season. With $18.82 million in cap space remaining, he would be a bargain signing that the Hurricanes could easily afford. If Brind’Amour cannot solve this conundrum and sticks with Aho at center, he will risk throwing off the career trajectory of the Hurricanes best player. This is especially problematic at a time when the Hurricanes are negotiating a new contract with Aho, and it risks the success of Brind’Amour’s own tenure as head coach of the Hurricanes. In the end, Aho certainly has first-line capability on the wing, but he will fail if forced to play center. This is not comforting news to Hurricanes fans, but it is the truth.